← It’s definitely that time of year again….Fall! Earlier this year trend experts predicted that “Artistic details, a blend of textures, bold colors, and ethnic decoration patterns will figure in loudly when it comes to hotel interior design…” and it appears they were correct in their predictions. 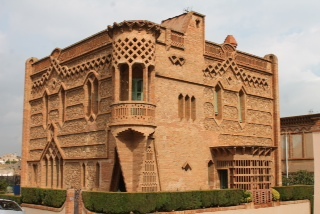 We have shared with you several times on this blog our opinion on and photos of the awe-inspring architecture of Antoni Gaudi and other Catalonia modernists, whose properties certainly met the above criteria almost a century ago. One is constantly delighted by the discovery of yet another aspect of their work as they study the materials, natural light, mosaics and “critters” that are seen in these buildings. But these artists/architects, contemporary for their time, do not stand alone when it comes to great design and a unique vision. For example, this contemporary home located in a small village in England is just as unique and functional as those designed by Gaudi and seems to meet all the criteria determined earlier in the year as upcoming hotel trends. And while this property is not a hotel but rather, a vacation rental, (we are unable to share the photograph with you) you can see and read all about it here. With quite a story behind it, the architect/artist duo of Charles Holland and Grayson Perry come together to create this very unusual abode, all with the goal of introducing contemporary architecture in a manner that would be available for “ordinary” folks to live in and experience. Set on an acre of land and fronting a river, it provides a stark contrast to the serene landscape surrounding it. Regardless of how you feel about living or working amongst the bright colors, contemporary furnishings and unusual artwork and sculptures, you must admit that this very unique property is functional. There is plenty of natural light and a workable floor plan and a bathtub big enough for the entire family. However, I must admit that the large and colorful mural on the bedroom wall might make it difficult to get a good night’s rest! And even though the herringbone patterned flooring could induce a bit of vertigo, the built-in furniture and cheerful kitchen are utilitarian and could remind one of the design characteristics behind the Arts & Crafts movement of the early twentieth century. Frank Lloyd Wright often incorporated built-ins that enhanced the flow and space of his designs and took advantage of any natural surroundings. 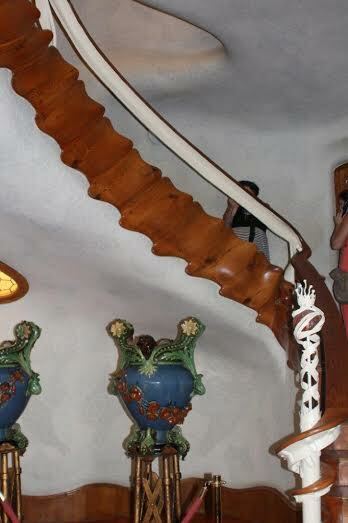 Is this unusual abode a place you might consider for a vacation rental? This entry was posted in architectural hardware and tagged catalonian architects, catalonian modernists, contemporary architecture, contemporary design, modern vacation home. Bookmark the permalink.